By 1800, England had achieved world supremacy in commerce, industry and increasingly in finance. A liberal ideology, perceived as key to this success was opposed to state involvement in education and the voluntary and religious societies assumed responsibility for this. An early burgeoning of science and technology led by industrialists such as Matthew Boulton and the Dissenting Academies ended in the reactionary climate following the Revolution in France. 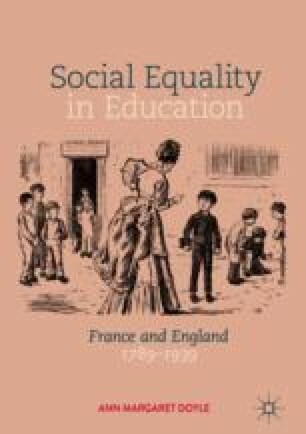 Secondary education with its ‘public schools’, the preserve of an upper class elite, was divided on social class lines. At the end of the chapter the historical data is analysed in terms of the three explanatory factors: persistence of ideology, social class alliances, and, the nature of the state.